The 1970s Diet: Bring on the Badge Wars! Is a standing joke between myself and my friend. I am talking about Brownie Badges. My sister once said "ohhh mum's are soooo competitive" and I was like nah we're not, no one really cares but who am I kidding?! I've seen plenty of competitive mum's living out their dreams via their children since my entry into parenthood some 10 years ago. Little did I know, that I too, may also fall into this category but not in the my child is on this level or that level (speaking of which my eldest is working at SATS level 6 - OMG where did he get that from?! I did eat a lot of tuna whilst pregnant which they say makes brainy babies maybe that was it. Couldn't help myself see I'm no different god damm it!) or give it the large on facebook. I only show boat to approx 2 friends as there are just times when you really do genuinely burst with pride. Asides from that I keep it under my hat or say it to my husband to which he promptly pisses on my maternal bonfire by remarking "yeah how's the child genius that can't work out how to put a duvet cover on!?" 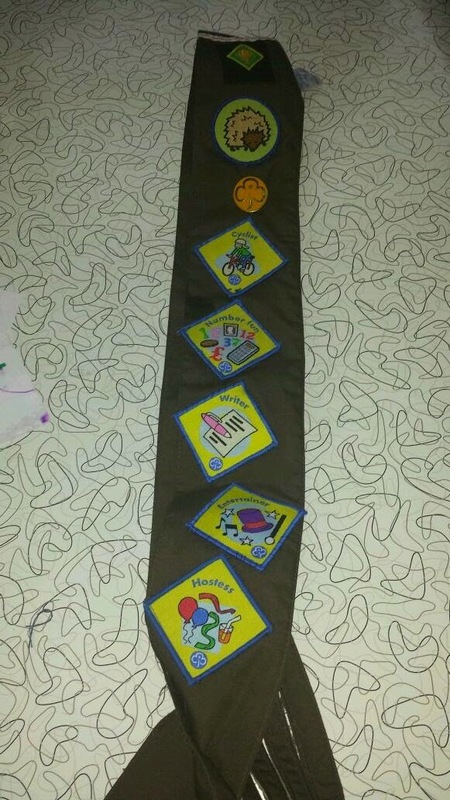 Anyhow, what of the Brownie badges? My friend and I have a tongue in cheek "how many badges you got now then?" thang going on. The gauntlet has been thrown! My daughter got off to a cracking start - 3 badges no less - and let me tell you they ain't that easy to come by. In my day, you didn't have this stupid sash thing to sew them on, you sewed them on your uniform so you did. You also carried out your badges during the Brownie meeting, now you have to do them at home and then tell Barn Owl (normally a typed dossier) on how you've done. I went totally off the rails by signing the Brownie book. Oh no missus, you can't do that and I was promptly reprimanded by a stern looking Barn Owl who enquired rather forcefully I might add "who signed this?" She knew full well, full well. Me I said meekly reverting back to my 10 year old self. Then I quickly remembered I was, in fact, 40 years old and said "I didn't know, I thought I could..." actually who am I kidding I was putty in her hands. So you have to kind of do the bloody things together. I mean one element 'home maker' - which on the face of it looked fairly simple started to descend into unnecessary complicatidness (new word). For example, it said make a game out of re-cycling symbols?!! We ditched the home maker. Not to be out done my friend taunted me in the last holidays - "we're doing 3" - they also ditched home maker (see above). So she's quickly catching us up. I think we are now up by 1 solitary badge although the novelty is wearing thin. The badges are so tough to sew on but by all accounts you can glue them on with special Brownie badge glue! Oh my! My nan would be turning in her grave so I do sew them on unlike my friend who sends them to her mother-in-law. Having said this, maybe I should send mine to her as well as this is what they look like once I've been at it! Nan's the world over are turning in their graves! Right, I am off tomorrow until Sunday to France with the hubster - so I will talk more of my return.